Marshall County girl’s and boy’s cross country teams, along with Head Coach Chris Kerrick, celebrate both teams advancing to next Saturday’s state meet in Lexington. 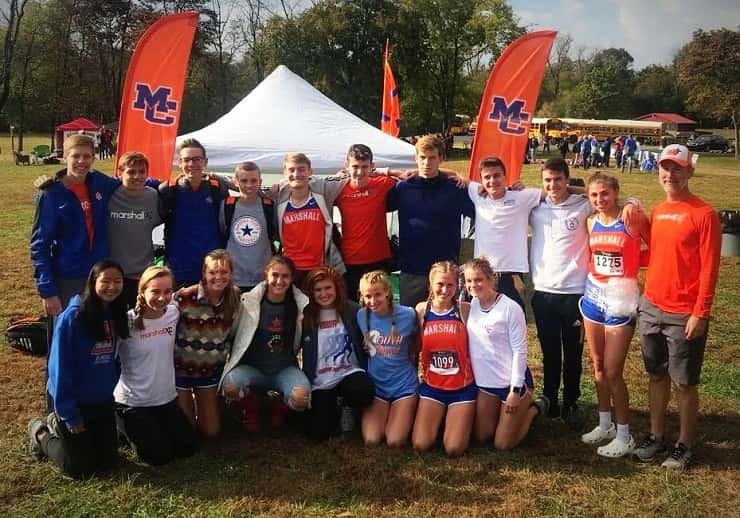 For the third consecutive year, the Marshall County boy’s cross country team qualified for the KHSAA State Cross Country Championships with their third place finish in the Region 1 Class 3A meet Saturday at Yellowcreek Park in Owensboro. The Lady Marshals qualified for state with a fifth place finish, marking the first time since 2013 that both teams have qualified. Last season, along with the boy’s team, Gabbi Lovett and Alexia Minter qualified as individuals and this will be Minter’s third straight trip to state, also qualifying in 2016 while in the seventh grade. In Lexington last fall, the Marshals placed 19th in the state meet, the best finish for a Marshall County boy’s team since 1998. The top two finishes for the boy’s team came from Mason Cosner in 14th with a time of 17:17.15 and Ethan McCarty finishing 16th in 17:23.93. McCarty, an eighth grader, finished second the previous Saturday at the middle school state meet. Jackson Miller finished just outside the top 20 in 21st (17:33.14), Samuel Lanham 23rd (17:34.25), Knox Sandlin 24th (17:35.13), Christian Cosner 25th (17:37.41) and Ethan Dowell 30th (17:45.42). Madisonville-North Hopkins won the Region 1 Class 3A team title, also taking first and second with seniors Christian Parker (15:22.74) and Garrett Watts (16:00.48). Three of top five teams also earning a trip to state, second place Apollo, Daviess County fourth and Muhlenberg County fifth. Gabbi Lovett finished 11th to record the top finish for the girl’s team in 20:32.32 followed by Alexia minter 23rd (21:39.55), Leah Vincek 32nd (22:21.03), Tarryn Story 35th (22:37.46), Kaycee Kemp 44th (23:11.61), Zoie Swoope 46th (23:25.67) and Hannah Perry 48th (23:39.39). McCracken County’s Maggie Aydt took first in 18:31.01 to help lead the Lady Mustangs to a second place finish behind Daviess County who won the team title. Madisonville-North Hopkins placed third and Apollo fourth to round out the teams qualifying for state. In Region 1 Class 1A, Fulton County won the boy’s title and St. Mary took the girl’s team title. University Heights won the individual titles with Thomas Duncan (16:38.08) and Muki Kunnmann (20:36.86). Class 2A winners were the boy’s from Webster County and the Paducah Tilghman girl’s team. Individual winners were Webster County’s Ryan Roland (16:38.75) and Tilghman’s Addie Rogers (21:14.33). The state meet takes place next Saturday, Nov. 3, at the Kentucky Horse Park in Lexington. Class 1A starts at 9:30 am (EST), Class 2A at 11:30 am (EST) and Class 3A begins at 1:30 pm (EST).